An estimated 35,000 people will be flocking to North Carolina's largest city to attend the three-day convention in early September. CHARLOTTE, N.C. — For Dustin Read, the upcoming Democratic National Convention in Charlotte seemed like a surefire way to make extra money. An estimated 35,000 people — from delegates and journalists to scores of protesters and police — will be flocking to North Carolina’s largest city to attend the three-day convention in early September. He figures some of those visitors might want a bigger place to stay than a cramped hotel room with no backyard. So a few months ago, Read listed his three-bedroom, two-bathroom house as a short-term rental. His price: $7,000 a week. It’s a similar situation in Tampa, host city for the Republican National Convention: homeowners looking to make a quick buck all with the added benefit of giving them a chance to get out while their hometown is overrun by convention-goers and snarled with tightened security. Charlotte and Tampa officials say they have enough hotel and motel rooms to handle the crowds. But some listed their homes just in case people wanted an alternative to hotels. They’re banking on landing visitors who didn’t plan ahead and need a place to stay and also targeting big groups with deep pockets, such as lobbyists who want more space to entertain. When homeowners in the two cities first began listing their properties, the prices were steep. Some were asking up to $20,000 a week. One Charlotte homeowner wanted $50,000 to rent his five-bedroom house for a month. With less than a month to go before the conventions kick off — the Republicans are meeting the last week of August in Tampa, while the Democrats are holding their convention the first week of September in Charlotte — people are lowering their prices. Just ask Fran Goods. She placed an ad on Craigslist a few months ago for her two-bedroom, 1,000-square-foot condo about five miles south of Time Warner Cable Arena, where the first two days of the Democratic convention will be held. On the last day, President Barack Obama will make his acceptance speech at the 74,000-seat outdoor Bank of America stadium where the city’s NFL team plays. 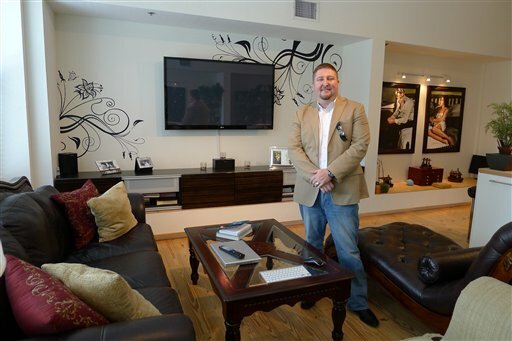 In Tampa, James Griffin has put his one-bedroom loft in the downtown on Craigslist, asking $1,250 a night. If he gets any takers, he’ll go elsewhere and not get caught up in the traffic snarls, security issues and crowds who will descend on his hometown the last week in August. Griffin listed the condo, which is located a short 10-minute walk to the convention site, two weeks ago. He’s offering a king sized bed, washer-dryer, Internet and security system. Still, he’s gotten no offers that he would consider realistic. So far he’s gotten only calls from people wanting to come to Tampa to protest the convention. He’s still holding out hope that someone wants to stay close to the convention and is willing to pay the $1,250 a night. Like Tampa, the convention is a big deal to Charlotte. It’s the highest profile event the city has ever hosted. Unlike Tampa, Charlotte is not used to the short-term home rental market, something that’s common in resort communities. Charlotte doesn’t have a beach or mountains. People visit the city of 760,000 people for museums, including the NASCAR Hall of Fame, or to watch the Carolina Panthers or the NBA’s Charlotte Bobcats play. It’s a banking and financial center. When people stay in Charlotte for a week, they’re usually there on business. And when they do, they book hotels. Simon Le, a business manager for Group 15, a real estate company handling short-term convention rentals in Charlotte, said he’s been receiving nearly a dozen phone calls each day from people who want to list their homes — but only a few calls a week from prospective renters. And his company has gotten picky. They will only take houses within two miles of Uptown, Charlotte’s main business district. He said he expects to rent more homes just before the convention. Some homeowners haven’t given up. On Craigslist, there were 904 listings for convention home and apartment rentals in the the Tampa Bay region. The price, quality and location varied widely. One listing was for a 3-bedroom, 2.5-bath luxury townhome along Tampa Bay for $20,000 for the week. Another was for $175 a night for a 7-night home rental near a campy mermaid-themed water park 90 minutes north of the convention site. Not only does the city of Tampa have plenty of hotel rooms, but there is a longstanding condo-hotel-apartment rental culture across the bay on Pinellas County’s sugar-sand beaches. Because of the year-round sunny weather, nice beaches and golf, Tampa and Pinellas County are home to a thriving second home culture as well. Factor in plummeting home values, high unemployment and a weak economy in the Tampa Bay region, and it’s easy to see why homeowners would want to pounce on those renting for the RNC. The trouble in actually cutting any deals is twofold, real estate agents say: Too many property owners offered their homes for rent and set out-of-reach prices. Nick Nicholson of Bradenton, Fla. decided to list his second home on Craigslist recently for $200 a night during the RNC. He bought it as an investment and it’s empty at the moment. It has three bedrooms, a pool and is near the beach, about an hour south in Bradenton. Nicholson knows the location might be working against him. “I just kind of threw it out there,” he said. Nicholson also offered another perk: chauffeur service. In the ad, he offers to drive the renters around in his Lincoln Town Car. So far, no one has bitten.